Why Google search results favor Democrats. His search results are off the charts! Democratic Presidential candidate Bernie Sanders speaks in Manchester, New Hampshire, Nov. 29, 2015. As early as 2010, researchers at Harvard University started finding evidence that Google’s search rankings were not so objective, favoring its own products over those of competitors. A Federal Trade Commission investigation into the conglomerate in 2012 also indicated evidence that the company was using its monopoly power to help its own businesses. So it’s no secret that Google search results aren’t a font of objective and unbiased information. Now, as we enter into prime-time politics season in the U.S., the searching for candidates is heating up. So what do Google’s biased search results mean for the election and for democracy itself? Google is not fair; it favors some candidates, and it opposes others. And so far, it seems to prefer Democrats. Our crowdsourced analysis of Google search results on Dec. 1 for the names of 16 presidential candidates revealed that Democrats fared better than Republicans when it came to supportive and positive sites within the first page of results. Democrats had, on average, seven favorable search results in those top 10, whereas GOP candidates had only 5.9. To be clear, we’re not suggesting that Google is a digital arm of the Democratic Party. But our analysis clearly shows biases and differences in the results surfaced around the various candidates. Could those biases be caused by a single rabid software engineer? Possible, but highly unlikely. The bias is more probably an organic, emergent result constituted from a complex prism of quantification involving hundreds of signals and increasingly complex and opaque artificial intelligence. But if this is happening “organically” as the Google algorithms respond to various inputs, maybe it’s high time to rein in or at least double-check how this new actor in the democracy is behaving. 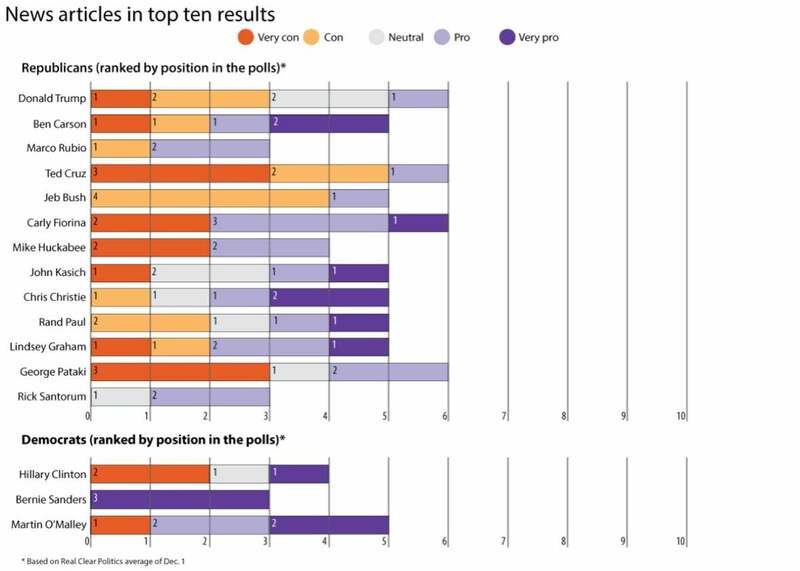 Our data was collected by automatically gathering nonpersonalized search results from Google for each candidate’s full name, focusing on the top 10 result links and excluding advertisements. The first page of results is important because that’s where users end up clicking 7 out of 10 times. Next, we asked our crowdsourced raters to evaluate each website on two scales: one that measures its favorability toward a candidate and another to gauge its opposition to him or her. For each candidate, some websites are completely supportive, some are completely against, and some have a little bit of both. We validated the method against our own careful coding on a subset of data and found the crowdsource workers to be accurate. It’s worth saying that we collected results in D.C., but we know geography can affect nonpersonalized search results, so we’ll be looking to collect results in other parts of the country in the future to see how they vary. Another pattern in our data is that candidates tended to dip in favorability as you move down in the rankings. On average, candidates’ first results have a 2.2 on our positivity score, which runs from 4 (most positive) to -4 (most negative). By the 10th ranked result, the average score drops to 0.9. That’s because the negative results tend to show up in the bottom, after the official websites and social networking profiles. This is significant in light of a 2007 study published in the Journal of Computer-Mediated Communication showing that people also trust results that appear higher in the Google search results more. Notice that this metric changes according to party. 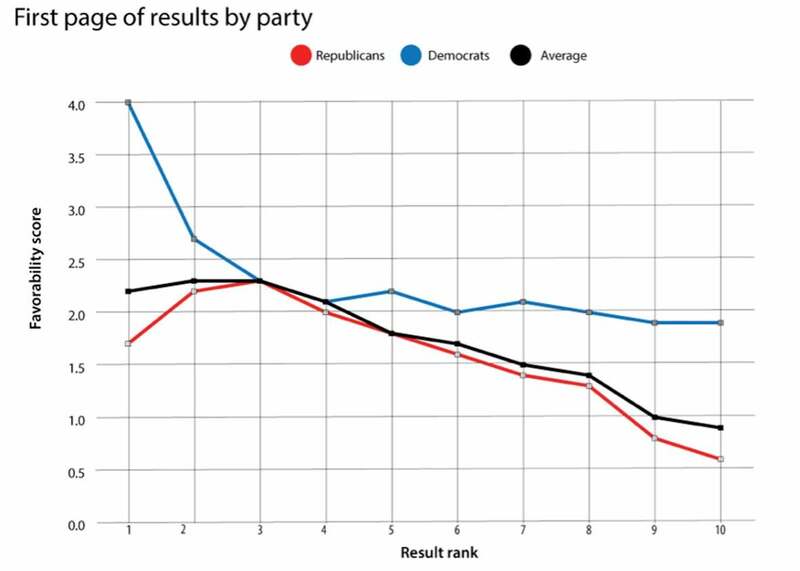 Democrats start higher than Republicans and drop off at a slower rate. And then there are the outliers like Chris Christie. He has a negative result ranked first: That’s where 31 percent of organic clicks are. 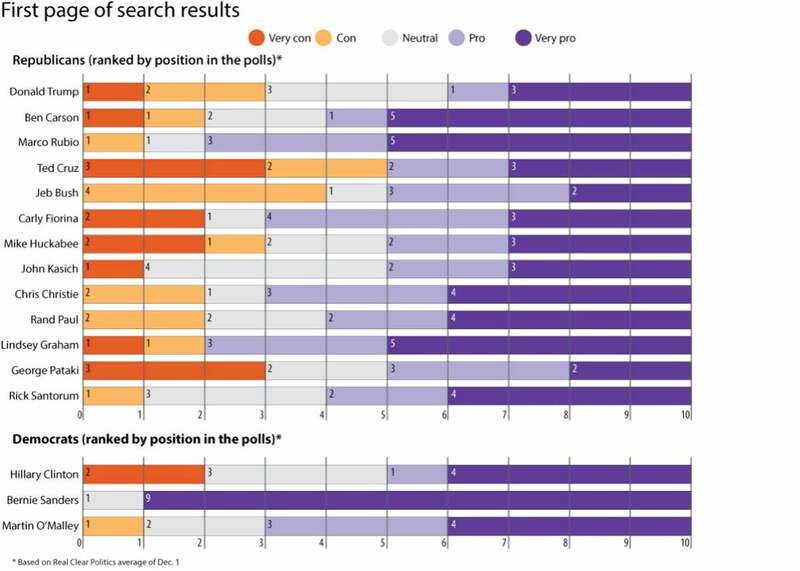 If voters are looking for information with Web searches and can be swayed by what they see, that kind of bad result early on in a high-traffic rank can affect the electorate’s perception of a candidate. It’s not clear whether these kinds of results could predict changes in the race. Comparing contenders for each party is telling. Donald Trump had four positive and three negative search results on the first page. Hillary Clinton had five positive results and only one negative on the first page. Ted Cruz had more negative results than anyone else, and Bernie Sanders was the king of positivity—with nine “very pro” results and not a single negative. Of course, all of this could change tomorrow—though we did get substantially similar results when we ran the same experiment two weeks earlier. The favorable sites are mostly run by the campaigns, including official congressional sites and social media profiles. The negative results tend to be news articles that are critical of the candidates. So why is Google surfacing more negative news stories about Republican candidates? And why do unflattering websites for other candidates not show up? Having a big social presence is key. 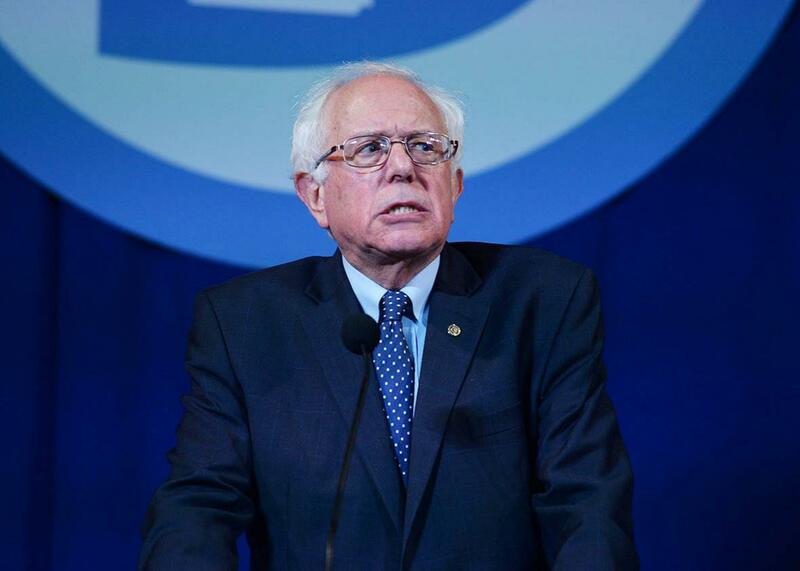 Sanders’ search results include a Facebook profile, his Twitter feed, and his YouTube account. Add three links from his websites and a neutral Wikipedia page about him, and there is only room for three news stories, one from the Huffington Post, one from the Washington Post, and the last from Time, all of which are favorable to Sanders. Cruz, on the other hand, has only one Facebook account and his two websites. The rest of his results are his Wikipedia profile (slightly positive) and a wave of news coverage that is predominantly negative. This is all consequential because search engines have the power to affect elections. In a study published last August in the Proceedings of the National Academy of Sciences, Robert Epstein and Ronald E. Robertson write that “biased search rankings can shift the voting preferences of undecided voters by 20% or more.” Their sequence of studies showed that biased rankings in a hypothetical search engine could sway voters, and moreover, that the vast majority of those voters didn’t even notice the bias. Without a doubt, the Internet is a growing force in shaping the political debate. More than half of adults in the United States went online to get information about the midterm elections in 2010, according to a Pew study. For 24 percent of adults, the Internet was the main source of campaign news, and that was five years ago. The Epstein study reported that 86 percent of participants used a search engine to learn about political candidates. In the U.S., that means Google, mostly, with 63.9 percent of the market, distantly followed by Bing (20.8 percent) and Yahoo (12.5 percent), according to comScore. And there’s the illusion of neutrality. About two-thirds of Americans who use search engines believe they are completely unbiased, according to a 2012 Pew study. The study showed that “73 percent of search engine users say that most or all the information they find as they use search engines is accurate and trustworthy.” Search engines are more trusted than the news media itself. We’ve shown that, even in their nonpersonalized incarnation, Google search results are biased in ways that could affect access to political information leading up to the 2016 U.S. elections. All of this adds up: The public needs to be more aware of search engine bias when getting political information, and Google itself needs to acknowledge its power and take an active role in benchmarking results around certain political queries—candidates as well as issues. Google should be applauded for its efforts in publishing a transparency report, which includes various useful disclosures about takedown requests and censorship. But those disclosures should be expanded to include more information about its own products, including how Google ranks and provides access to political information both in the U.S. and around the world.